Today was Mason’s second swim lesson — a fun, exhausting adventure. 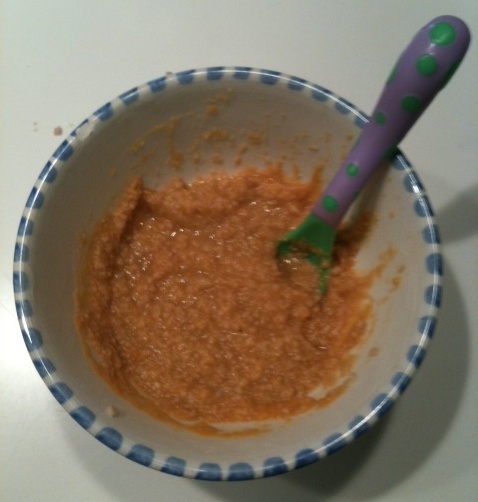 When we got home, it was time for lunch: Turkey-Apricot Puree and yogurt mixed with pureed pear and green beans. The babe needed a protein blast because of all the energy it took for him to paddle and kick (sort of) up and down the mini lanes in the pool, not to mention fall off the pool edge into my arms like Humpty Dumpty and whirl around in a circle while the parents sang Itsy-Bitsy Spider off-key. I started with ground turkey because it purees more smoothly than cooked and shredded turkey tenderloin. By itself, the turkey is mild so you definitely need to mix it with something flavorful. I loved the idea of apricot because it’s bright and tangy — the ideal match for the tender white meat. Other great things to mix turkey puree with: potatoes and peas, sweet potato and peach, butternut squash and apple, and banana and pear. Mason loved his lunch — hope your babe enjoys the recipe too. Let us know how it goes! 1. Bring a pot of water to boiling then reduce the heat until the bubbles are soft. Add ground turkey and cook until all the pinkness is gone (about 20 minutes). 2. Drain the turkey, plunge in ice water to stop the cooking, and puree until only slightly chunky in the food processor. *I use ground turkey because it purees smoother than shredded turkey tenderloin. For Turkey-Apricot Puree, combine two ounces of turkey puree with two ounces of apricot puree. *Freeze for up to three months. Next So Long, Beaba Babycook!